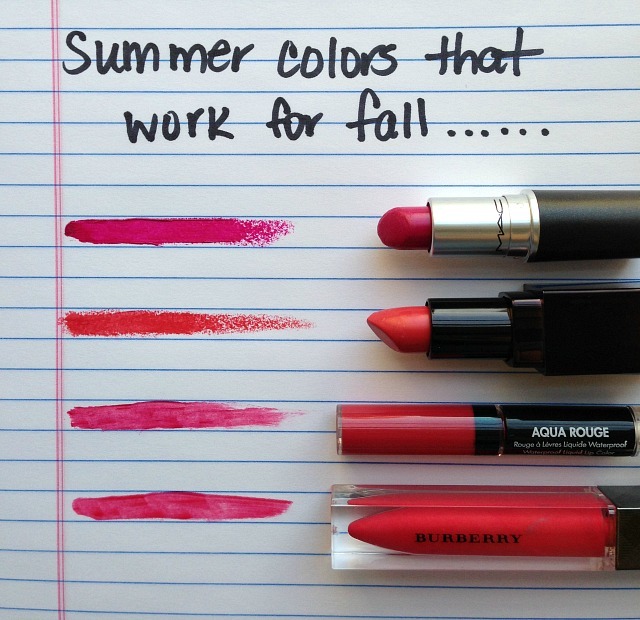 Just when I was fully jumping on the bright lip bandwagon, the weather had to go and change it's tune to fall. RUDE. But after playing around with a bunch of my current colors, I found some really great ones that will transition quite well. I find that summer lip colors tend to be bright but with a more neon, vibrant tone - as opposed to fall which are often just a few shades deeper and richer echoing the color palette of both fashion and the surrounding landscape. Here are four lip shades that you can wear now while the last bits of summer hang on and into the coming months when you will need a jolt of color to the face to help it look semi-alive during the frozen tundra weather conditions. I'm sorry - that last part was just mean. It won't be that bad. 1. MAC Girl About Town - A name synonymous with how you will feel when strutting your stuff while wearing this bold fuschia. The pigmentation is rich and long lasting, and the texture is very creamy so it will be a great fit during the winter months when dry lips become de rigueur. 2. Laura Mercier Mango - The name may say summer, but the color is pure intensity. A coral with a tinge of red, this will look perfect with all those fall neutral brown and taupe eye shadows. 3. Make Up For Ever Aqua Rouge in No. 19 - A rich raspberry liquid lipstick that dries down to a matte finish, while the other end is a moisturizing clear gloss that you can add for extra shine. Surprisingly for an all day wearing product, it does not leave my lips dehydrated, and the gloss is a nice texture change mid day. 4. Burberry Lip Glow No. 19 - In the tube this color can be quite deceiving as it reads a bit neon, but when on it gives a beautiful deep pink lip. Definitely the brightest out of the bunch, but will wear well with a rosy cheek and lots of mascara. Oh, and a big fuzzy scarf.